The flowers from your garden are so lovely and so is your mosaic! I perused several of your posts and enjoyed each one. Beautiful cards! Nice stopping by! Oh Donna! I know how much you enjoy gardening and to make a mosaic from your flowers is wonderful. You seem to have many talents! I believe we share another craft. 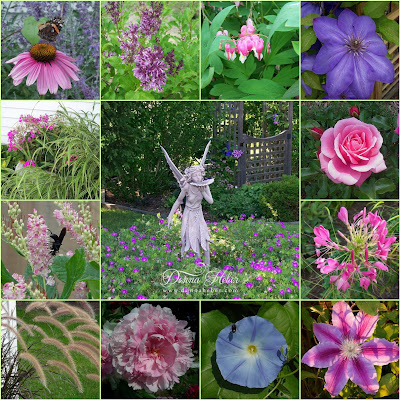 I love my flower garden and my favorite part of my garden is taking photos of my flowers. You have some really nice ones here. Looks very nice. These are so beautiful...I am a bit envious of your garden, Donna!! Wonderful photographs, too! Donna, this is just breath taking!! The flowers are beautiful!! I love the angel in your garden. I collect angels, and I have a large angel tatooed on my back!! Your photos and layout are absolutely gorgeous! What a beautiful garden. I find peace in my garden and can't wait to find it once the snow finally leaves. Thanks for sharing. what a glorious time spring is with the emerging of the new flowers. You have shared a lovely mosaic with us. Thankyou for coming to my blog, it was lovely to hear from you. So pretty....the flowers, photography and page. Gorgeous flowers!! My favorite thing about spring-seeing all the new blooms. I'm getting excited for spring to arrive. I can see some green sticking up from the ground that tells me it's on its way. By your pictures, your garden must be stunning. Thanks for sharing.